No it's not Alaska, it's Rouses Point, NY in the winter. 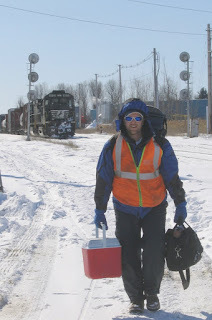 A brisk -22 degrees and that's not a mountain man, but our own Kenny Olsen, D&H Conductor, prepared for the winter cold. February 19th working Train 931.